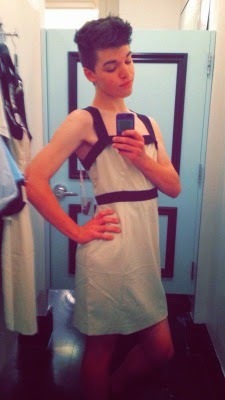 If you follow current events in the trans community then you probably already know who Leelah Alcorn was. If you don't, she was a 17-year-old trans girl from Ohio, a talented artist, and, most importantly, a human being. Last Sunday, in the early morning, she walked 6 km from her house to the interstate highway and stepped in front of a truck. She died at the scene, having posted an eloquent and moving suicide note to her Tumblr. The note blamed her fundamentalist parents and their refusal to accept her as anything other than a "perfect little straight Christian boy," something she could never be. Yesterday her mother, Carla Alcorn, spoke briefly with the media, affirming that "we don't support that, religiously, but we told him that we loved him unconditionally." I've been pretty shaken up by her death. She and I share a similar background. I don't know what would have happened if I'd come out at age 14, like she did. I think it's probably best for me not to think about things like that. By the time I did finally come out, at 26, my parents had grown a little more open-minded and were able to accept it. UPDATE: It seems her Tumblr page has been taken down. Fortunately, someone thought to archive it on Wayback Machine, (although her oldest posts, including the above selfie, are still lost). I've changed the link in the article to point there instead. This story is so heartrendingly sad. I see echoes of my own family in many ways, and shudder to think what might have happened had I told them at Leelah's age. As for her mother's statement that they loved her "unconditionally"... I am at a loss for words at the level of self-deception it takes to say such a thing. I waver between contempt, rage, and pity for them. In the end, they aren't worth it. Leelah deserved, and deserves, better. I wish I could make some sense of this, but I cannot. I cannot. I'm glad your family has been accepting, hon. That is well-worth celebrating. Living your life to its fullest is the best way you, and all of us, can honor Leelah's memory. I know. It makes me feel like a hundred different emotions, all at once. It's very difficult to process. I hope some day her parents come to recognize their culpability in all this.